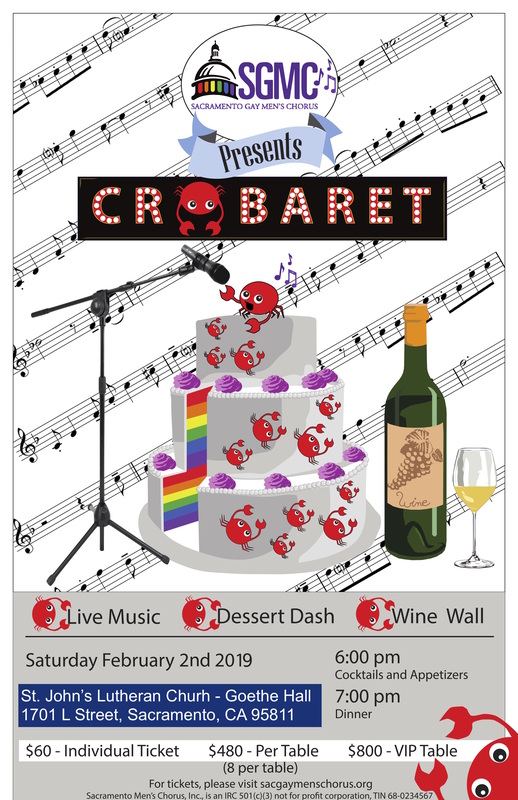 Sacramento Gay Men's Chorus - SGMC Presents our 2nd Annual "Crabaret"
SGMC Presents our 2nd Annual "Crabaret"
Crab Feed, Pasta & Bread, Wine & Beer, Live Auction, Raffle Prizes, and a Dessert Dash. Join SGMC for our 2nd Annual "Crabaret"
Join the Sacramento Gay Men's Chorus for our 2nd Annual "Crabaret" Fundraiser! Enjoy the sweet serenades of the Sacramento Gay Men's Chorus throughout the evening at our 2nd cabaret event. 100% of proceeds support SGMC in furthering our mission and vision in the community. Your continued support means the world to us and keeps our fabulous organization alive and thriving. "Foster Pride & Enhancing Lives, One Song at a Time!"